1880s autograph album of Ward Stetson of Warren, Maine. 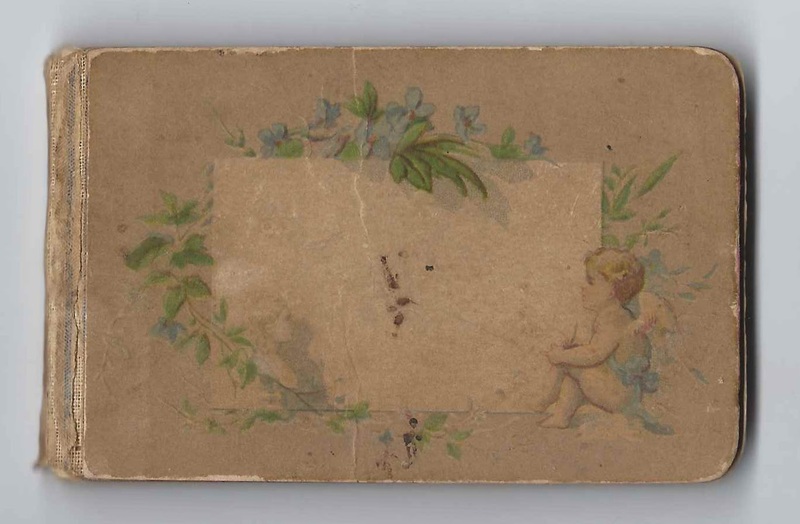 The album is approximately 4" x 2-1/2" and contains the sentiments of 24 of Ward's relatives, friends and teachers. An alphabetical list of the signers appears at the end of this post. Ward Stetson was born 12 October 1871 at Warren, Maine, the son of Anson and Matilda R. (Russell) Stetson, who were born at Warren, Maine, and Waldoboro, Maine, respectively. Matilda R. (Russell) Stetson made two entries in the album, the entry with "Mother" being the first signed page in the album, and the other, dated June 12, 1881, near the end of the album. On 17 October 1893, Ward Stetson married Abbie Jane Lermond, daughter of Leroy C. and Emily Ruth (Thomas) Lermond. Abbie was born 12 January 1875 at Thomaston, Maine. Ward and Abbie lived at Warren, Maine, and raised a daughter Mildred, born in 1896. Ward died in 1929 and Abbie in 1946. 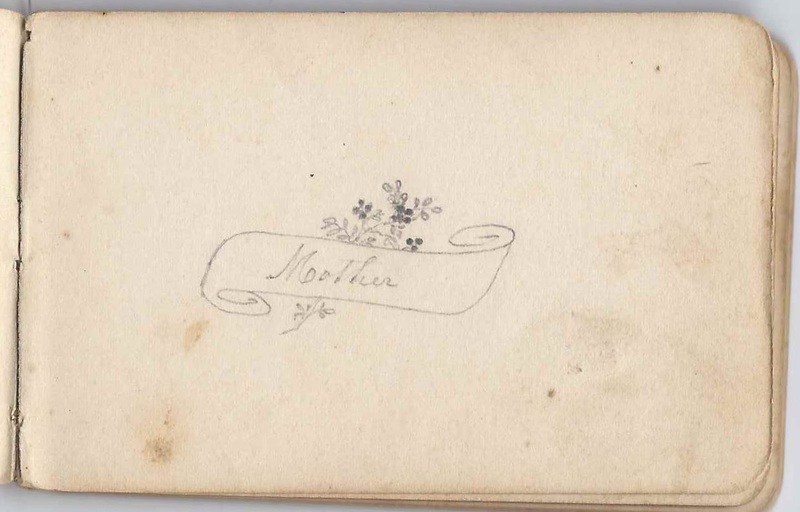 Angie H. (Collins) Skinner and her husband Andrew A. Skinner signed facing pages at North Warren, Maine, on April 9, 1882. 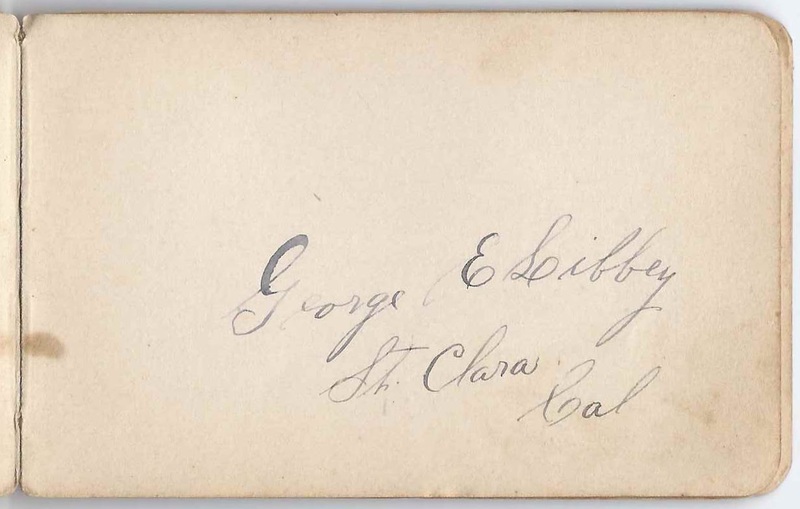 George E. Libbey of Santa Clara, California, signed a page. He may have been the George E. Libbey born at Warren, Maine, on 18 July 1849, son of Rufus and Barbara (Kalloch) Libbey. If so, his brother John K. Libbey also signed a page. Cora E. Fish, signed on May 4, 1881. She may have been Ward's teacher. 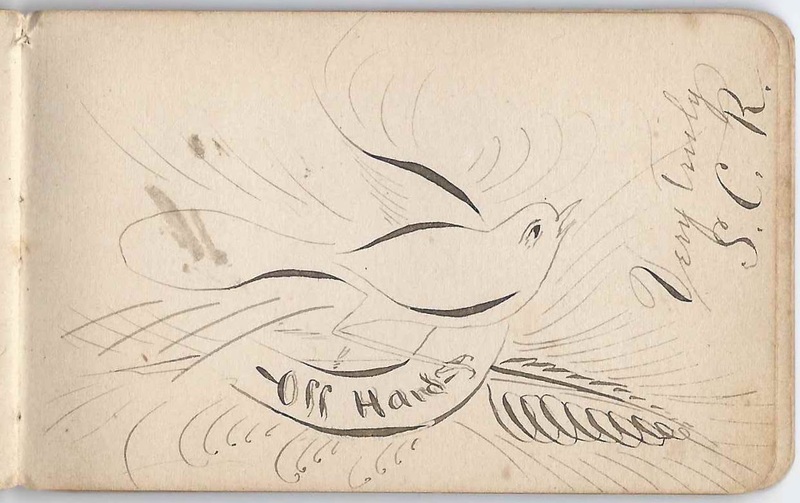 Olive Maxcy, signed at Thomaston, Maine, on October 25, 1888 [or 1883]. Presumably the Olive Maxcy who was born about 1864, daughter of Joseph and Mary Mahala (Gross) Maxcy. J. Murray Miller, born about 1872 at Thomaston, Maine, son of Amasa and Jane F. (Russell) Miller; brother of signer Louise Miller. Louise R. Miller of Thomaston, Maine, signed in 1882; daughter of Amasa and Jane F. (Russell) Miller and sister of signer J. Murray Miller. G. S. Pendleton, signed at North Warren, Maine, on December 15, 1883. He was George S. Pendleton, whose wife Helen D. (Gerrish) Pendleton signed the right facing page. H. D. Pendleton, signed at North Warren, Maine, on December 15, 1883. She was Helen D. (Gerrish) Pendleton, whose husband George S. Pendleton signed the left facing page. Lina Pendleton, signed at Warren, Maine, on November 20, 1883. She was the daughter of signers George S. and Helen D. (Gerrish) Pendleton. A. H. Skinner, signed at North Warren, Maine, on April 9, 1882. Angie H. (Collins) Skinner, whose husband Andrew A. Skinner signed the right facing page. A. 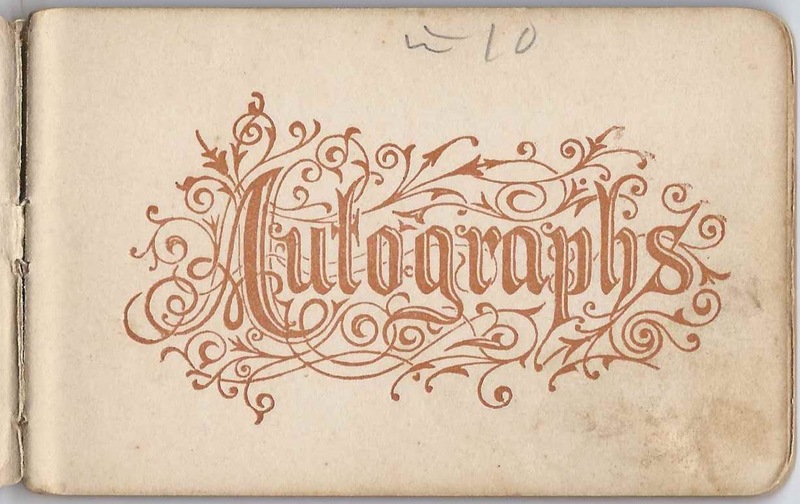 A. Skinner, signed at North Warren, Maine, on April 9, 1882. Andrew A. Skinner, whose wife Angie H. (Collins) Skinner signed the left facing page. 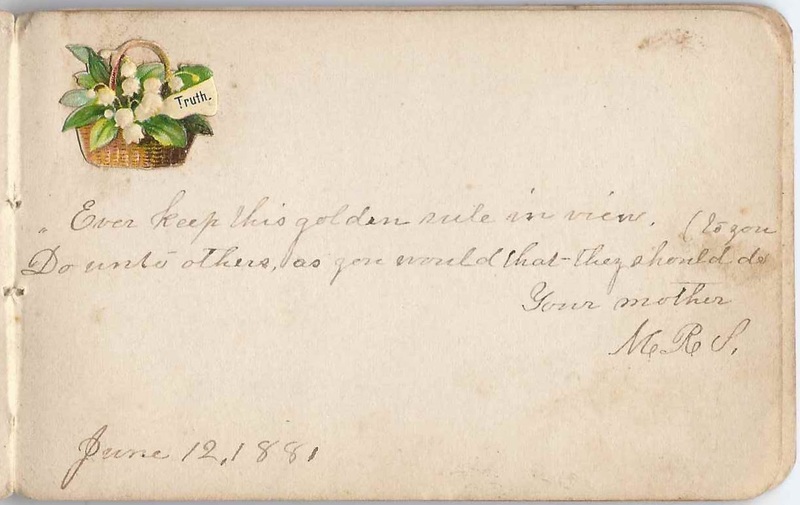 "Your mother" M. R. S., signed on June 12, 1881. She was Matilda R. (Russell) Stetson, Ward's mother.